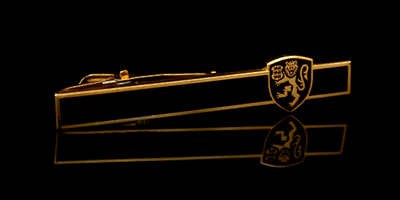 Bespoke Tie Clips, tie bars or tie pins are a suitable gift to someone important to you. A bespoke tie clip may use a logo or tell a story about the company and its area of expertise, either way it will be unique to your organisation. The highest quality jewellery enamel (vitreous enamel) can be used in the design of the tie clip together with precious metals, normally sterling silver or gold, to give the tie clip extra value and a stunning appearance.